Lembaga Pengelola Dana Bergulir Koperasi dan Usaha Mikro, Kecil dan Menengah - Lembaga Pengelola Dana Bergulir KUMKM or known as LPDB-KUMKM is an independent financial services agency in Indonesia which was formed to managing the revolving fund for the financing of small medium enterprises and cooperatives in Indonesia. Lembaga Pengelola Dana Bergulir KUMKM operates under the Ministry of Cooperatives and Small and Medium Enterprises of Republic Indonesia (Indonesian : Kementerian Koperasi dan UKM). 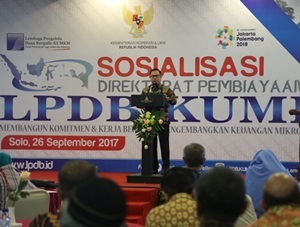 According to information found in Lembaga Pengelola Dana Bergulir KUMKM's website as cited by JobsCDC.com, Lembaga Pengelola Dana Bergulir KUMKM was formed in 2006 based on the Decree of the Minister of Cooperatives and SMEs Republic of Indonesia No 19.4/Per/M.KUKM/VIII/2006 dated 18 August 2006. Lembaga Pengelola Dana Bergulir KUMKM is based in Jakarta and its head office is registered at Jl MT Haryono Kav 52-53 Jakarta 12770. Preferably have an educational background in the field of Economics or Engineering. Have the ability to compile and take actions related to supervision, monitoring and evaluation. Have the ability in data analysis. Preferably have an educational background in the field of Economics. Good understanding about the concept of Risk Management and its application. Good understanding about about the aspects of conventional or sharia finance. Preferably have an educational background in the field of Economics or Statistics or Law. Have the ability to handle, evaluate related problematic accounts. Preferably have an educational background in the field of Economics (Accounting). Have the ability in financial planning. Have a good understanding of tax provisions (preferably certified Brevet A and B). Preferably have an educational background in the field of Information Technology / Information Systems. Minimum 2 years of experience as Database Administrator (DBA). Have a good understanding and mastering about the database (MySQL / PostgreSQL / Oracle). Good understanding about about the concept of an integrated system. Preferably mastering the programming language. Preferably have certification related to the database. Preferably mastering the system design. Preferably have an educational background in the field of Law. Have an understanding of business or Islamic finance law and its application. Good understanding about the concepts and mechanisms in credit and loan funds channeling. Able to work in a teams and work with individual targets. Preferably have an educational background in the field of Economics, Sharia Economics or Engineering. Good understanding about the concepts and mechanisms of financing channeling in accordance with Sharia principles. Have the ability and skill in the audit process (risk based audit). Good understanding about the implementation of forensic accounting. Good understanding about the Computer Audit Software (CAS) System or Generalized Audit Software (GAS). Have good knowledge and ability in the field of accounting and taxation regulations. Preferably have an educational background in the field of Secretary. Minimum 2 years of experience as a secretary. Good ability in communication, correspondence and filling. Computer literate, minimum MS Windows. Minimum Bachelor Degree (S1) with minimum GPA of 3.00 for State Universities and 3.25 for Private Universities (Scale 4.00). Preferably a maximum age of 30 years old. JobsCDC.com now available on android device. Download now on Google Play here. Please be aware of recruitment fraud. The entire stage of this selection process is free of charge. Lembaga Pengelola Dana Bergulir KUMKM - Non CPNS Staff LPDB KUMKM February 2019 will never ask for fees or upfront payments for any purposes during the recruitment process such as transportation and accommodation.